Make simple and healthy food for you and your baby. BabyFood101 supports both you and your baby in eating well. We include recipes for baby food as well as recipes for adult food. Don't just make baby food - make adult food and give some to your baby! We believe that good eating habits start with the parents. You are the model for your child and you are busy. We help you plan your meals to include your baby. My baby will be born soon. My baby will be trying solids soon. My baby is already eating solids but is less than one year old. My baby is already one year old. You can give your baby apples starting at 6 months old. You have a choice between commercial baby food, jars of applesauce, and making your own with fresh apples. We recommend that you buy organic because 91% of apples tested by the USDA were found to contain pesticide residue. If you are buying applesauce, read the label to ensure that there is no added sugar to their mix. Ascorbic acid is one added ingredient to apple sauce that should cause no concern. It is Vitamin C and it is used as a preservative to keep the applesauce from turning brown. 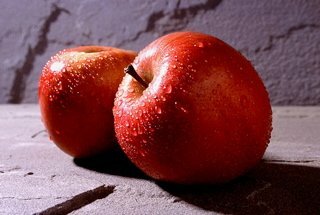 Look for apples that are firm and without any visible bruising. Unfortunately, you are going to have to peel the apple for your baby since it is really hard to chew. Most of the nutrients are in the peel but an apple is still a good first food. Also, you should cook the apple to make it soft enough for baby to eat. Cooking Directions: Peel, slice, and core apple. Cover with water and heat on stove or in microwave until soft - maybe 3 minutes depending on how thin you sliced it. Mash cook apples to babies desired consistency. One of your jobs as a caregiver is to model good eating for your child. We thinks now is a good time to start cooking and eating more fruits and vegetables. When your baby grows into a toddler, you will be already setting a good example! Below is a recipe for the apples that you will be buying for baby.